A gold-rush town is no place for a single mother. But widow Lana Bristow won’t abandon the only home her son has ever known. She’ll fight to remain in Treasure Creek, Alaska—even if it means wedding Mack Tanner, the man she blames for her husband’s death. Mack sees marriage as his duty, the only way to protect his former business partner’s family. Yet what starts as an obligation changes as his spoiled socialite bride proves to be a woman of strength and grace. A woman who shows Mack the only treasure he needs is her heart. Mack Tanner looked up to see a raging storm coming toward him. "Good morning," said the storm, otherwise known as Lana Bristow. Each syllable of her greeting was sharp and steely. She stood in that particular way he called her "speechifying" stance, which heralded an oncoming verbal assault. Mack spread his own feet, not particularly eager to endure whatever was coming in front of the half dozen gold rush stampeders he'd managed to hire off the Chilkoot Trail to build his new General Store. Lana's blond hair was a nest of frayed locks, strands sticking wildly out of the careful twist she usually wore. Her apron hung diagonally across that impossibly tiny waist of hers, with a wide smear of something dark that matched the smudge currently gracing her son Georgie's chin. The brooch she always wore at her neck—that silly, frilly flower thing with all the golden swirls on it—was gone. It was held bent and misshapen, he noticed with a gulp, in her left hand, while she clamped two-year-old Georgie to one hip with her right. One side of her hem was soaked and the boy sported only one shoe. More was amiss than the argument he'd had with her last night, that was certain. They'd gone at it again regarding Lana's accounts. Her mounting debts had been a constant sore spot between them since her husband, Jed—Mack's best friend—had died in the Palm Sunday avalanche. She'd caught him monkeying with her store credit again, giving her more than what she paid for and "misplacing" numerous bills. And yes, Mack had taken it upon himself to slash her debt so that no one in Treasure Creek would guess the sorry state of her finances. She didn't see it that way. Instead, his "generosity" made her furious. Why that confounding woman wouldn't let him settle things up for her—when she needed it and he had the resources to easily do so—never ceased to amaze him. Lana stood stiff and tall. "I have something to say." Mack could have been blind, deaf, half asleep and still have picked up on that. Every inch of her body broadcast "I have something to say." A low commentary grumble to that effect rippled through the men around him until Mack raised his hand—the one with the large hammer still in it—to silence them. Not taking his eyes off her, Mack shifted his weight and nodded slowly. For a moment he considered motioning her toward a less public place, seeing as this was no doubt going to be a long "something to say," but the flash of fire in her blue eyes told him to stay put. He had the odd sensation of facing a firing squad. "Yes." That single syllable loudly declared, Lana spun on her heels, hoisted her son farther up on one hip, and started back down the way she came. Mack's mouth fell open, letting the nails tumble out to jingle on the ground at his feet. Yes? What kind of riddle thing was that to say? Glory, but the Widow Bristow would be the death of him. The men found this hilarious, sputtering into laughter and less-than-polite commentary until he threw down the hammer and strode off after her. Once away from the crowd, Mack expected Lana to turn and explain herself. It's what rational people did, after all. When after twenty paces she failed to either turn or slow, he bellowed, "Yes what?" after her. It echoed across the intersection, raising heads on either side of the roads that made up the center of tiny Treasure Creek. Lana stopped and whipped around to face him. The sudden move forced Georgie to grab at her just to stay upright, balling the neckline of her blouse in his toddler fists. Lana glared at Mack as if he must be dimwitted not to catch her meaning. "I said, 'Yes what?'" he shouted again, not caring which of the curious onlookers gathered on the boardwalks heard him. Lana furrowed her brows so far down she looked catlike. She flicked her eyes around at the small crowd now staring at them, as if his simple request for a reasonable explanation was some sort of cruel punishment. Lana took three steps toward him, and with something more like a hiss than a whisper, said, "For the seventh time, yes." Having spoken her piece, she turned once again and set off up the boardwalk away from him. It struck him like a bolt of lightening, thundering though his chest as if struck by the hammer he'd held moments ago. As in "Yes, I will marry you." He'd asked her six times over the last two months, the first time only a week after her Jed's tragic death. Marrying her was the best way to protect her now. After all, he'd lured Jed up here with the promise of fortune and adventure. A promise that ended with Jed buried in snow, alongside dozens of other stampeders who refused to heed their guide's warnings that Sunday. He could have done more to stop Jed, to make his foolhardy buddy see reason and be cautious. But he hadn't, and now Lana was left up here on her own—without Jed and without the fortune he'd made and subsequently lost. He'd asked her over and over after that, even though she blamed him for Jed's death, knowing she'd rather marry a log than wed the likes of him, well aware of how much she disliked him, but equally aware that it was the only real way to make it up to her and her son. He'd asked her every time she struggled with this thing or that, every time she'd looked weary from keeping up appearances. He asked every time it looked as if the endless struggles of Alaskan living—and the greedy stream of despicable Alaskan men—were about to do her in. Once, when a drunken "old friend of Jed's" had actually tried to drag her off to Skaguay and marry her by force, he'd even offered to pay her way back to Seattle. She had no family left back there, but he was plumb out of ways to keep her safe when too many stampeders still thought she held Jed's riches. After all, he'd known Jed's lust for gold was growing beyond reason and into desperation. He could have tried harder to protect Jed from the impulsive nature that was always his undoing. The fact that Jed was gone was his fault. She knew he could have tried harder to save Jed, too. She'd refused every single offer of help. Until now. So why was his now new fiancee stomping off without an explanation? He'd lived long enough to know that a female could be the most furious of God's creations when provoked, but he would not allow her to stomp off with the last word. Especially when that last word was "yes." Grumbling that his keen sense of obligation would likely be the death of him, Mack set off after her. She stalked past the white church—one of the first buildings he and Jed had built when they founded the town—and still didn't look back. Georgie did, though, catching Mack's gaze with troubled brown eyes under that mop of curly dark hair. His mama kept up her furious pace, past the other shops and houses, attracting the stares of the men gathered along the boardwalk. She and Georgie were sulking off to her cabin, from the looks of it. She had to know he'd follow her, even if she kept her back ramrod straight as she turned the corner past the schoolhouse. The Tucker sisters, a trio of rough-and-tumble gals who'd spent the past month working on that building, stopped their work to look up at the spectacle. Lucy Tucker waved, but Lana stomped on, paying Lucy no mind. Buildings sprung up overnight like mushrooms here in Treasure Creek. Mack felt on display as the sisters gawked among themselves. With his town nearing a thousand residents and ten times that many rushing through in a steady stream toward the Trail, why did all them have time this morning to watch Mack Tanner make a fool of himself? Lana didn't think she had any tears left to cry. She made her way back through the crowded, muddy main street, past the church Mack and Jed had insisted mark the center of the town they'd founded together just three months ago. Three months that felt like thirty years. She picked her way as fast as she could past the schoolhouse under construction, the bank and several rows of cobbled together shacks where farmers and butchers sold food. She didn't stop until she reached the cabin she and Georgie called home. She hadn't expected to cry, couldn't believe that tears threatened now, and would not, absolutely would not cry in public. Mack was behind her, she knew it. And he ought to be, if he had an ounce of compassion in that stubborn, domineering head of his. She was sure she heard the thud of his angry boots behind her as she rounded the corner beyond Mavis Goodge's boardinghouse, but she wouldn't give him the satisfaction of letting him see her turn. She'd done it. She'd surrendered to the only viable option available to her in Treasure Creek. Some "treasure." It was awful here—cold and crude, muddy and noisy—and this was one of the better towns. It seemed ages ago when Mack and Jed had founded Treasure Creek. They'd been full of big ideas, seeking to create a place of faith and values in the lawless, greedy chaos of the gold rush. Only it hadn't turned out that way. Not for her. Yes, Treasure Creek had become known as a God-fearing town, but what good had faith done in the face of all the rampant swindling of the Chilkoot Trail? Faith hadn't kept Jed off the trail that Sunday, even though the guides warned "the mountain was angry." Faith hadn't squelched Jed's relentless need to chase gold rumors, skipping Sunday services to meet an Indian guide boasting leads to an undiscovered lode. God hid no huge, undiscovered treasures up on that mountain. In her darker moments, Lana believed God sent the deadly wall of snow, stranding her up here and stealing Georgie's father. A vengeful God punished her husband's greed, backing her into so dark a corner that she must accept a marriage of convenience to Mack Tanner. She laughed at the thought as she pushed open the door of her cabin and stepped into the tiny confines. It wasn't a marriage of convenience. It was a marriage of survival. And survive she would. Here, because here seemed to be the only place there was. It had struck her last night, after yet another argument over her accounts with Mack, just how bad things had gotten. The point had been pushed home, literally, when she snatched her favorite brooch out of Georgie's hand and pricked herself on the now-bent pinpoint. The toddler had gotten into her jewelry box when she'd left it open after sorting through which jewels she might be able to sell discreetly in Skaguay. Some jewelry box. The rustic chest Jed had built her on her last birthday could barely be called such a thing. Life here was nowhere near what she dreamed it would be. She ought to be thankful that Georgie hadn't speared himself with the brooch before she found him. As it was, Georgie had managed to bend and dent the soft gold by banging it against the hearth until its floral shape was lost forever. Why did she wear a brooch out here in the first place? Purely ornamental, it wasn't strong enough to hold a shawl or cloak together and it snagged on everything. Still, she wore it daily, a flag of refined defiance. No one would ever know how badly Jed had left their finances. She was and always would be "a lady of means." Trouble was, she had precious little means left. Lana had realized, as she stared at the broken brooch, that her former self—the delicate Seattle socialite who'd followed her husband on his grand fortune hunt—no longer existed. She couldn't limp back to Seattle and be some man's useless ornament. She craved independence now, but it was a hollow craving without sufficient means. Women could achieve astounding independence up here. The concept of "female" had been reinvented in Alaska. Transformed into something she wanted very much to be. She couldn't bring herself to turn from that freedom now. Not only that, but to sulk back to Seattle would be to admit that Jed and his adventures had all been nothing more than smoke and mirrors. Lana refused to count herself among the thousands of duped and squandered fortune hunters. Treasure Creek, for all the pain it held, was still the lesser of all available evils. Seattle might be more comfortable, and there were things Georgie could have there that she could never give him here, but Lana had swallowed so much pride over the past three months that she didn't think she could stomach the feast of humility it would take to head south. I'll do whatever it takes to stay here, she told herself as she pulled the cabin door shut behind her with a declarative slam. Whatever it takes. She turned and looked at Mack through the cabin's only window. Even if it takes him. The tears she'd held in finally burst out in sobs so great they shook Georgie as he clung to her side. He stood perhaps a hundred paces from her home, staring at her closed door. The patient, dark expression on his face mirrored the way he looked that awful night Jed died. I’ve decided I really like adventures. Not just treks to exotic places, but the right-under-your-nose kind of adventures. The inner ones, where you get one of those “ah-ha” moments that shifts your life’s direction. Or the local ones, where you discover places and people that can enrich your life on a daily basis. Sometimes, when you are very fortunate, you get to write about both. 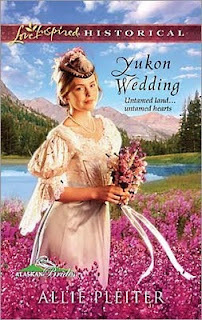 In Yukon Wedding, Mack and Lana are at the ragged tail of a Yukon adventure, but just at the beginning of their journey toward each other. It takes a grand landscape like Alaska to host a grand love story, don’t you think? I love to write larger-than-life settings because it shows the common human center of any epic tale. Mack and Lana could be anywhere when you get right down to it, but their struggles against the Gold Rush’s hardships amplify their joys as well as their troubles. When I think of romances in epic landscapes, I think of movies like Dr. Zhivago, Casablanca, and Titanic. What love story plays out on your favorite grand setting?